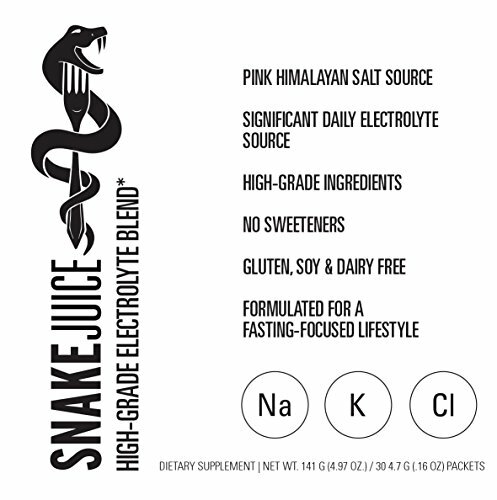 Ideal product for long fasting windows, travel, sports or flu recovery where electrolyte recovery is crucial. Mixes easily into water without a grainy texture. Non-flavored and non-sweetened electrolyte powder mixes into 2 liters of water to hydrate immediately. 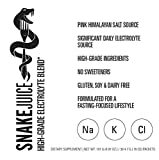 High-grade electrolytes including pink Himalayan salt which contains 84 important trace minerals such as magnesium and iron. Get four - five times the electrolytes of other hydration products without any sugar. Also contains sodium bicarbonate to buffer metabolic acidosis and maintain a whole-body pH equilibrium. A single packet provides a significant source of daily requirements of electrolytes to avoid dehydration symptoms of headaches, dizziness, muscle cramping and fainting. Inspired off the SNAKE Diet by Cole Robinson. Gluten, Soy & Dairy Free, Non-GMO and Vegan friendly.